Description: D&H GP38-2 #7315 at Oneonta yd. office. Description: An ex LV unit at Oneonta. 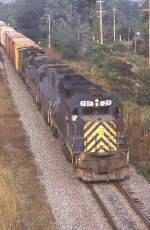 Description: D&H GP38-2 #7315 in Carbondale yd. 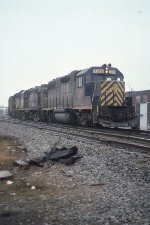 Description: D&H GP38-2 #7315 tied-down in Carbondale yd. Description: D&H GP38-2 #7315 on point of BS-1 stopped at WC Cabin, Simpson, Pa. Description: 7315-MEC 228 at Bevier St. Description: POPY pulling a cut of cars out of the yard at East Deerfield West. Negative badly discolored, B&W version in "B&M in B&W" album. Description: POPY pulling a cut of cars out of the yard at East Deerfield West. Negative badly discolored, color version in "Boston & Maine Vol 1" album. Description: The extra 305 west at Greenfield East. Description: Typical colorful lashup during Guilford era. Description: D&H power at West Cambridge yard, possibly early 80s. Photo by Eric/Todd Larsen.